“The letter ‘e’ identifies boats designed for use with electric propulsion, a fast-growing segment at Princecraft,” to quote from its 2011 brochure. Not only are the Princecraft Brio ͤ models 15 and 17 pontoon boats, designed specifically for electric motor propulsion, new for 2011, but also the Torqeedo models Cruise 2.0R and 4.0R electric outboard motors that are available as propulsion for these new Princecraft boats, improved for 2011. First the boats. There is exactly two feet difference in overall length of the two models (15’1” vs. 17’1”) but construction-wise, they are identical, each with two, 23”-diameter tubes, made from .080” aluminum with multiple airtight chambers and with full-length extruded aluminum keels and pontoon skirting. The ¾” pressure treated wood deck covered with 20-oz. “Cut Loop” marine carpet is supported by Z-aluminum cross channels. Both boats have a 7’6” beam. The 15 weighs 1094 lb. (496 kg) and the 17 weighs 1306 lb. (592 kg). Forward of the starboard side Rotomolded helm console with acrylic top sporting a quick release smoked windscreen, both models are almost identical with a smaller lounge to starboard, and a larger lounge seat to port. All lounge seating aboard has built-in storage beneath the top cushions. The two feet difference in the two models is most noticeable aft of the helm. The model 15 has an “L”-shaped lounge to port whereas the model 17 provides a smaller lounge to starboard behind the helm seat plus a larger lounge to port. Both have identical bow and stern platforms beyond the anodized aluminum safety rails. Side and stern boarding gates are on both models. 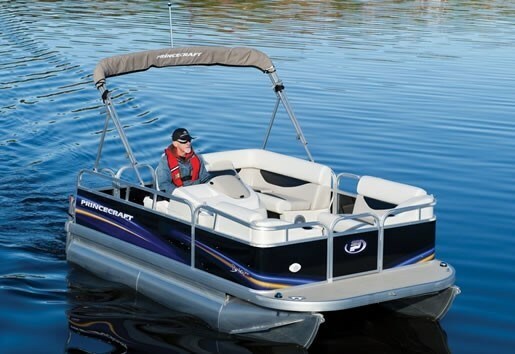 Both come standard with a beige buggy bimini top, a molded dash panel with black inserts and lighted switches, a 12-volt outlet, and an AM/FM/CD stereo with iPod controls, four speakers, and satellite radio compatibility. Full camper enclosure and mooring cover are optional as is a “Comfort Package” offering tilt steering, stern snack table, stern ladder, and a slider for the driver’s swivel, folding fishing seat. A beige, oval bow snack table is available only for the model 17. Torqeedo of Starnberg, Germany has been producing electric outboard motors since 2005 and offers several models from a lightweight kayak motor through tiller controlled models for tenders and dinghies to remote-controlled single and twin installations. Technically, Torqeedo has incorporated some fascinating technology in its motors including electronic digital circuitry to replace brushes for less friction and less maintenance; reversing the normal positioning of magnets and coils to create greater torque; and utilizing rare-earth magnets for increased torque, all resulting in the ability to utilize larger diameter, higher variable pitched, variable camber propellers for greater speed and efficiency. Torqeedo claims to have by far the highest overall efficiency rates on the market of any gasoline or electric outboard motors. Two remote-controlled Torqeedo models, the Cruise 2.0R and the Cruise 4.0R are available on either of the two Brio ͤ models. 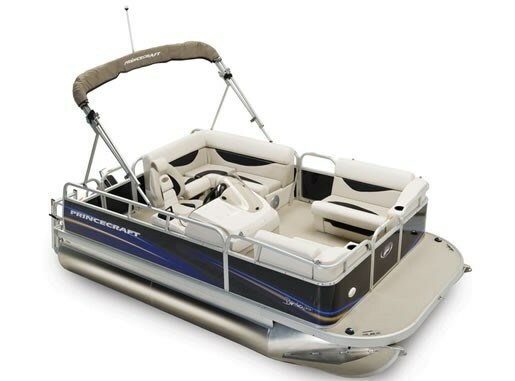 The Cruise 2.0R, comparable to a 5 hp gasoline outboard, requires a battery voltage of 24 V. The Cruise 4.0R, comparable to an 8 hp gasoline outboard, requires a battery voltage of 48 V. Both have manual tilt and trim and both can be connected to standard cable remote steering assemblies. The remote control for throttle plus forward/reverse has a digital readout on top indicating battery charge status and input power plus GPS-based remaining range and speed. Onboard battery chargers and boxes are standard on both Brio ͤ models and a station for an additional battery bank is available. Torqeedo is offering a new model Power 26-104 lithium battery power supply for 2011 which offers an advanced battery management system with protective features plus a dataport for communicating with the two Cruise models’ remote throttle control unit.